We will discuss about collection of data into HBase directly through flume agent. In our previous posts under flume category, we have covered setup of flume agents for file roll, logger and HDFS sink types. In this, we are going to explore the details of HBase sink and its setup with live example. As we have already covered File channel , Memory channel and JDBC Channel, so we will try to make use of Spillable memory channel in this agent setup to cover the usage of all flume supported channels. This does not mean that HBase sink needs only spillable memory channel and it equally works well with other channel types as well. Even in source types, we have already covered Netcat Source, Exec Source, Avro Source, and Sequence Generator Source types, so we will try to explain one more source (Spooling directory source) in this agent setup. Now lets create our agent Agent5 in flume.conf properties file under <FLUME_HOME/conf> directory. Add the below configuration properties in flume.conf file to create Agent5 with Spooling Directory source, spillable memory channel and HBase Sink. Before starting this agent, we need to make sure below things are ready. Start Hadoop and Yarn daemons. Also start Hbase daemons. make sure all the daemons are started running properly otherwise we will enter into hell lot of issues. For any assistance of Hadoop installation and running daemons we can refer to our previous posts under Hadoop category and for the same on Hbase, refer to hbase installation post. Below commands will be helpful for performing these activities. In Hbase, Create the table with column family specified in flume.conf file. 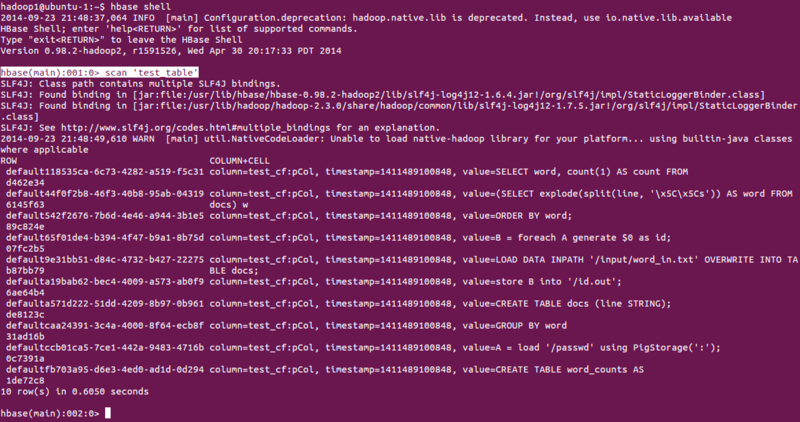 Below is the screen shot of terminal for creation of hbase table through hbase shell after starting all daemons. In our agent, test_table and test_cf are table and column families respectively. Create the folder specified for spooling directory path, and make sure that flume user should have read+write+execute access to that folder. In our agent, it is /usr/lib/flume/spooldir directory. We will copy our input files into spool directory, from which flume will write each line as a new row into Hbase table. We will copy the input file wordcount.hql into spooling directory and below are the contents of wordcount.hql file. And also we will copy one more input file id.pig into spooling directory and below are the contents it. So there are total of 10 (7+3) lines of input from two files. And each line will be treated as one event in flume. Make sure that flume user has full accesses to the directories mentioned in <checkpointDir> and <dataDirs> specified in spillable memory channel configuration. After confirming that all the above configuration is successful and there are no issues then we are ready to start the agent otherwise we will end up in undesired error messages or java exceptions. Start the agent with below command. After a few seconds (as there are only two small input files, a few seconds will be sufficient to copy into Hbase) stop the agent by pressing ctrl+c key. We can verify this agent process both at source level and at sink level as well. If we verify the spool directory after the agent is started and stopped, then the files which were placed as input to copy events into hbase will be renamed to .COMPLETED files, once all the events in a file are successfully copied into channel. Thus we can see all the files replaced with their corresponding .COMPLETED files. Below is the snapshot of spool directory after agent is stopped. In the above screen we can see id.pig.COMPLETED and wordcount.hql.COMPLETED files created in place of original input files. We can verify the events at sink level by connecting to hbase shell and scanning test_table contents. And we can see all the 10 lines of input inserted into pCol column of test_cf column family in test_table in the below screen shot. As all the 10 input lines are inserted as 10 rows into our destination table at HBase, We successfully configured the flume agent to capture data onto HBase sink. In below sections we will go into detailed descriptions of each component used to configure our above flume agent. In Spooling directory source, a spool directory will be configured in which users/applications are allowed to place their files, which need to be processed by flume agent. This source will watch the specified directory for new files, and will parse events out of new files as they appear. Once a given file is successfully read into the channel, it is either renamed to .COMPLETED file or deleted. Only uniquely-named files must be dropped into the spooling directory. This source will report problems and stop processing in below scenarios. If a file is opened to write contents into it after it is placed into the spooling directory. If a file name is reused at a later time. To avoid the above issues, it would be useful to add a unique identifier such as a timestamp to log file names when they are moved into the spooling directory. Below is the property table for spooling directory source and required properties are in bold. basenameHeaderKey basename Header Key to use when appending basename of file to event header. trackerDir .flumespool Directory to store metadata related to processing of files. If this path is not an absolute path, then it is interpreted as relative to the spoolDir. consumeOrder oldest In which order files in the spooling directory will be consumed oldest, youngest and random. In case of oldestand youngest, the last modified time of the files will be used to compare the files. In case of a tie, the file with smallest laxicographical order will be consumed first. In case ofrandom any file will be picked randomly. maxBackoff 4000 The maximum time (in millis) to wait between consecutive attempts to write to the channel(s) if the channel is full. decodeErrorPolicy FAIL What to do when we see a non-decodable character in the input file. FAIL: Throw an exception and fail to parse the file. REPLACE: Replace the unparseable character with the “replacement character” char, typically Unicode U+FFFD. IGNORE: Drop the unparseable character sequence. Spillable Memory Channel can be treated as a combination of memory channel & file channel. It is introduced to overcome the limitations of memory channel of losing events when memory queue is filled. It uses below two storage mechanisms. It stores events primarily in an in-memory queue and once the queue is filled, additional incoming events are stored on a disk backed up by the file channel. Below is the property table for spillable memory channel and required properties are in bold. memoryCapacity 10000 Maximum number of events stored in memory queue. To disable use of in-memory queue, set this to zero. overflowCapacity 100000000 Maximum number of events stored in overflow disk (i.e File channel). To disable use of overflow, set this to zero. overflowTimeout 3 The number of seconds to wait before enabling disk overflow when memory fills up. byteCapacityBufferPercentage 20 Defines the percent of buffer between byteCapacity and the estimated total size of all events in the channel, to account for data in headers. See below. byteCapacity see description Maximum bytes of memory allowed as a sum of all events in the memory queue. To disable the use of the in-memory queue and function like a file channel, we can set the property memoryCapacity = 0 and need to provide overflowCapacity, checkpointDir & dataDirs properties of channel. To disable the use of overflow disk and function as a in-memory channel, we can set the property overflowCapacity = 0 and can omit checkpointDir & dataDirs properties but need to specify memoryCapacity value to non-zero value. This sink reads events from a channel and writes them to HBase. 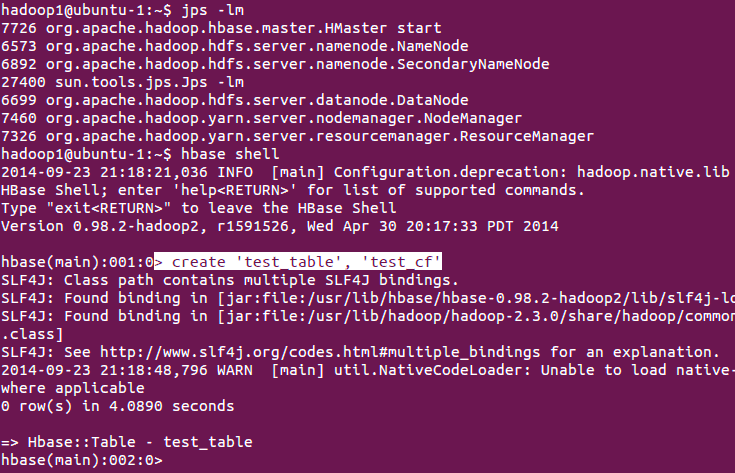 The Hbase configuration is picked up from the first hbase-site.xml encountered in the classpath. A class implementing HbaseEventSerializer which is specified by the configuration is used to convert the events into HBase puts and/or increments. These puts and increments are then written to HBase. table – The name of the table in Hbase to write to. columnFamily: The column family in Hbase to write to. This sink will commit each transaction if the table’s write buffer size is reached or if the number of events in the current transaction reaches the batch size, whichever comes first. Flume provides two serializers for HBase sink. The SimpleHbaseEventSerializer (org.apache.flume.sink.hbase.SimpleHbaseEventSerializer) writes the event body as-is to HBase, and optionally increments a column in Hbase. This is primarily an example implementation. The RegexHbaseEventSerializer (org.apache.flume.sink.hbase.RegexHbaseEventSerializer) breaks the event body based on the given regex and writes each part into different columns. Below is the property table for HBase sink and required properties are in bold. columnFamily – The column family in Hbase to write to. batchSize 100 Number of events to be written per txn. coalesceIncrements false Should the sink coalesce multiple increments to a cell per batch. serializer see description org.apache.flume.sink.hbase.SimpleHbaseEventSerializer. Default increment column = “iCol”, payload column = “pCol”. I had a question on using the Regex Interceptor. Can you please see the following link and reply (either here or there)? Thanks! Flume treats each line of your input file as an event and by default there is no chance that you can consider an entire file as a single event. But you may achieve that by writing custom source and channels via java code for this purpose. Advanced details on Regex Interceptors you can refer the page http://flume.apache.org/FlumeUserGuide.html#regex-extractor-interceptor. Thank you so much for clarifying that for me. Just to confirm, even if I used the regex filter, it would extract only the header and route that forward and everything else would be dropped, correct? Yes…It will drop all the records except the header record matching regex pattern. Thank you so much Siva!